Patriotism is one of the noblest and loftiest emotions of the heart, it should be along with our religion and our homes the first best thought. Where would be today our happy homes, if it was not for this strong government, whose beneficent laws, like the all pervading sunlight, are above and around us everywhere? Go where we will, all over this land, the same flag protects us. Laws not made by tyrant hands, “but by the people, of the people, and for the people.” Laws that if they ever perish, woe be to us in that day and hour… We are not yet out of the breakers. The astute leaders.. and the people they control; love the memory of their fallen institutions. They believe they were born to rule, they care nothing for the semblance of a ruler, so they in reality rale, and will never rest until they have gained by the ballot what they have lost by the sword. 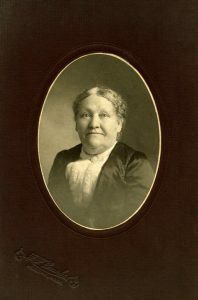 Emma Webster Brown was the first child and only daughter born to Elwood and Hannah (Webster) Brown, in Cecil County, Maryland, on April 8, 1832. Emma’s mother, Hannah Webster, was a descendant of some of the earliest settlers in America, arriving in the 1600s. There are documents indicating Emma’s mother was a direct descendant of William Webster, who came to America, from Scotland in 1685 and settled in Woodbridge, New Jersey. The Webster family left New Jersey, due to the religious persecution of Quakers and first settled in Abington, Montgomery County, PA prior to them eventually settling in Chester and Lancaster Counties, Pennsylvania. Shortly after Emma’s birth, Elwood and Hannah returned to Lancaster County, Pennsylvania, where Emma’s seven brothers were born. The family would remain in Pennsylvania until the late 1850s. On April 26, 1849, Emma married George Washington Harlan. George was the 2nd child and son born to Jonathan and Elizabeth (Thompson) Harlan. George was a 3x great-grandson of Michael Harland, one of Harland brothers who arrived at William Penn’s Colony at New Castle, Delaware in 1687. The brothers, were Quakers who emigrated from England and Ireland to seek freedom from persecution for their religious beliefs.